We are specialists at setting up solid security, addressing signal strength issues and expanding coverage area. 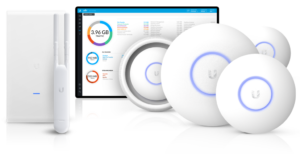 We use Enterprise-grade wireless devices from Ubiquiti to ensure stable and secure wireless connectivity from any area of your business or residence. We’ve performed many implementations in historic areas like Indian Hill and in congested areas like downtown Cincinnati where there are many stone, cement and plaster structures that limit the effectiveness of residential-grade wireless systems. A good, single unit long-range Wireless-AC access point system costs around $500 including 2 hours of on-site and hardware. A higher-end system with more than one access point starts at around $600. Call us to see how a minimal one-time investment can give you years of wireless stability and much less frustration. We also install less expensive wireless solutions for smaller homes or where usage is minimal. A basic system with installation will typically cost around $250.